Jahlil Okafor knows there will always be eyes on him - watching, dissecting, and waiting for him to one day bring the 76ers out of their rut. The spotlight won't leave. The rookie center isn't afraid of the expectations that come along with it. 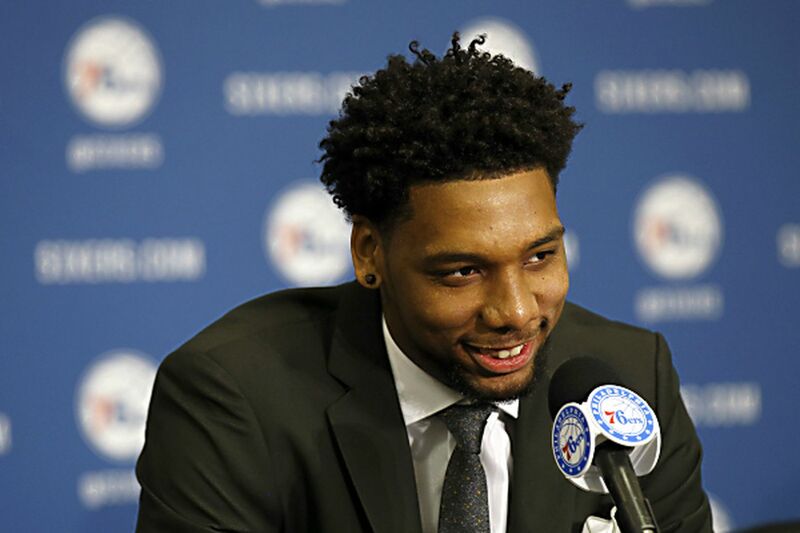 "My expectations are always higher than everybody else's," Okafor said during an introductory news conference on Saturday. The Sixers selected him third overall in the NBA draft Thursday at the Barclays Center in Brooklyn. Two days later, the 6-foot-11, 272-pounder sat on a dais alongside general manager Sam Hinkie and second-round picks Richaun Holmes (37th overall) and J.P. Tokoto (58th) at the Philadelphia College of Osteopathic Medicine, where the Sixers practice. While Holmes and Tokoto will be hoping to secure roster spots, Okafor instantly became a cornerstone, along with Nerlens Noel and Joel Embiid, assuming Embiid is healthy. "No matter what people were saying about me, myself, and my family, my expectations are always high," Okafor said. "So I don't have any trouble with expectations." He enters the NBA fraternity after a celebrated high school and college career. The 19-year-old was named the 2014 national high school player of the year by both USA Today and Parade magazine. That season, he led Chicago's Whitney Young to the Illinois High School Class 4A state title. Okafor went on to become a consensus college all-American who helped lead Duke to its fifth NCAA title last season. He averaged 17.3 points and 8.5 rebounds and made 66 percent of his shots. He was the first freshman in Atlantic Coast Conference history to be named the league's player of the year. In an era of hybrid centers and perimeter power forwards, he excelled as an old-school, back-to-the-basket post player. "I've always been the tallest guy in my age group," he said, "which always made me go right down to the post. When I was in the sixth or seventh grade, I fell in love with Tim Duncan and his all-around game. That's when I started watching him." Shortly afterward, his father educated him about Hall of Fame center Hakeem Olajuwon. It didn't take long for Okafor to model his game after those two players. "I've been dealing with that question for a while," he said. "Even when I went to Duke, everybody was asking: 'Why are you going to Duke? They don't have big men. They don't throw the ball in the post.' "
But he pointed out that he was the Blue Devils' leading scorer. "Now, they are saying, you don't need a big man," Okafor said. "But as far as I can remember, a big man has dominated the NBA. Tim Duncan won it [in 2014. That season] it was all about the big men with Pau Gasol and Kevin Garnett. "So people get a little excited because what [Golden State's MVP point guard] Steph Curry and those guys did was great. It worked. Their formula was fantastic. But as long as I can remember, big men have been dominant, and the results have been championships." The Sixers' other draft picks - Lithuanian center Arturas Gudaitis (47th overall) and Serbian power forward Luka Mitrovic (60th) - were not at the news conference. They are expected to remain overseas next season. The Sixers traded their 35th pick (Spanish power forward Guillermo Hernangomez) to the New York Knicks for two future second-rounders.